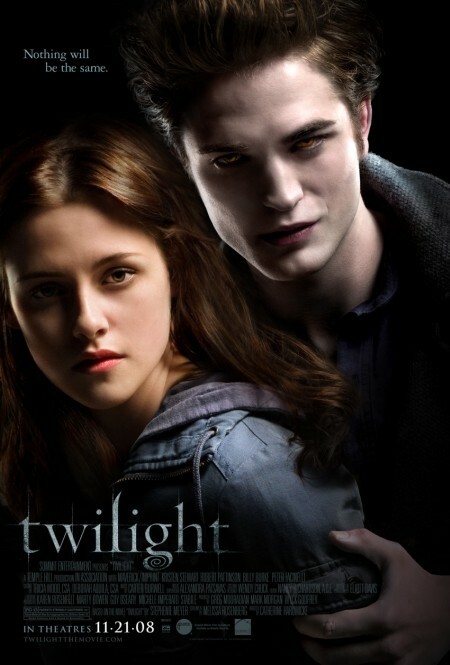 This is a poster for Twilight that I’ve seen everywhere. I think that this poster is perfect. It scares me. Which I never expected the movie poster to do, but which I like, since the books terrify me. Notice how Edward is looming over Bella and holding onto her arm in a creepy controlling way? Both subtle things, but perfect since the whole story in this first book/movie is about him stalking her and trying to sort of control her life from the outside. Bella just looks sort of oblivious and maybe a little confused. My first impression was that she looked vapid, but I don’t think she really does. I think she looks preoccupied, as if she has her head in the clouds. She looks like the kind of girl who would walk into a tree because she was daydreaming about something else and not looking where she was going. Which pretty much sounds like Bella. So while this appears to be a pretty boring poster at first glance, just two people staring out at you, it’s actually brilliantly composed. I have to give whoever designed this one a lot of credit – it’s perfect. It doesn’t make me want to have anything to do with the movie, but that’s primarily because it tells me that the movie is just like the book – which is exactly what a lot of people who will want to see the movie want to hear. It’s a perfect poster. This entry was posted on January 4, 2010 at 12:00 pm	and is filed under Entertainment. Tagged: celebrity, movie, poster, twilight. You can follow any responses to this entry through the RSS 2.0 feed. You can leave a response, or trackback from your own site.